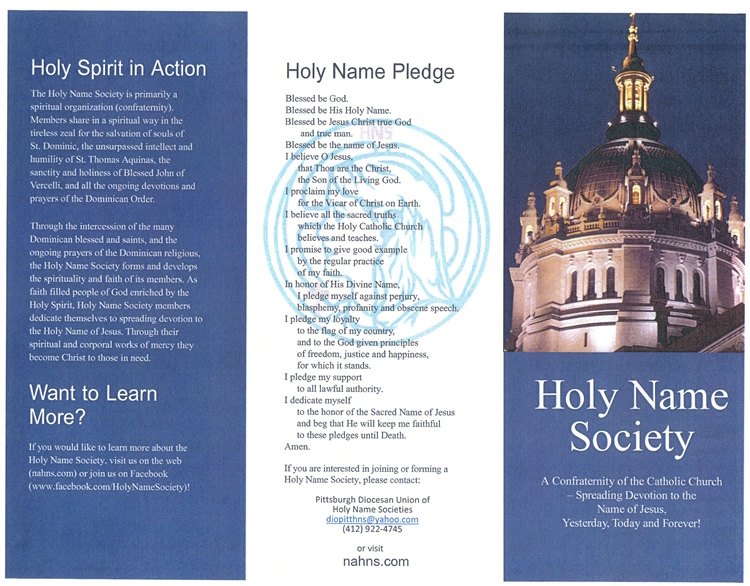 The Holy Name Society is an organization of Catholic men that come together to honor the name of Jesus in worship, prayer and parish activities. Monthly meetings begin with Mass, which allows men to pray together and strengthen their faith. Guest speakers are regularly invited to meetings. Holy Name sponsors many outings and parish functions. Meetings are generally on the third Tuesday of the month. Make sure to check the parish calendar to verify dates. Keep your eye out for Donut Sundays, sponsored by Holy Name! This event happens once a month after the 10:00 mass and is a very good community builder. We look forward to seeing you next time! Holy name sponsor's the annual Chavetta's Take-out Chicken Dinners which is always a huge success. These events sell out every year. Thank you to everyone who helps make these events so enjoyable! If you are interested in getting involved, please contact John Manning, President at bflojmfire@aol.com -OR- call our Rectory Office at 717-823-1122 or saintjohnsrec@gmail.com.